Light, toasty, wholegrain oats. Tip into a bowl and add your favourite milk. The toasty taste is naturally sophisticated. Like minimalism, but edible. Toasty, nutty, subtle and light, each and every one of these pure puffs is the grain, the whole grain and nothing but the grain. 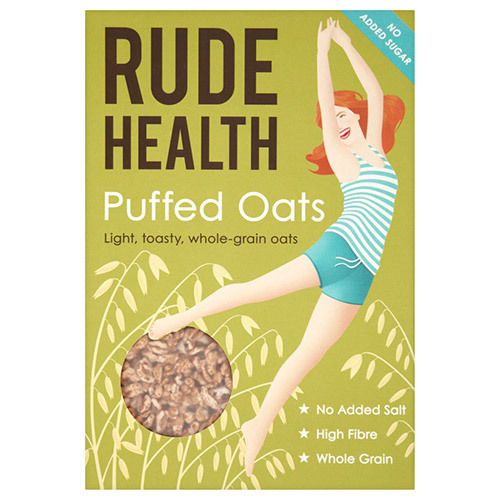 Thanks to Rude Health`s top secret popping method, the sensation is oaty and floating, while fibre is kept intact: soluble, insoluble, satisfying, cholesterol-lowering, heart-loving. No added anythings, so you can add your own choice of sweet somethings. Tip into a bowl and add your favourite milk. Below are reviews of Rude Health Puffed Oats - 175g by bodykind customers. If you have tried this product we'd love to hear what you think so please leave a review.